For four years – from January 2007 to April 2011 – twin-sisters Margaret Wertheim and Christine Wertheim kept all their domestic plastic trash; every bottle, bag, container, wrapping, and piece of packaging they used. Responding to the travesty of the Great Pacific Garbage Patch, the sisters decided to record their personal contribution to the plastic ensorcellment of our age. The Midden suspends this detritus in a fishing net as a record of two particular twenty-first century inhabitants of North America who were desperately trying to cut down. The project emerged as an exercise in anthropocenic self-awareness. 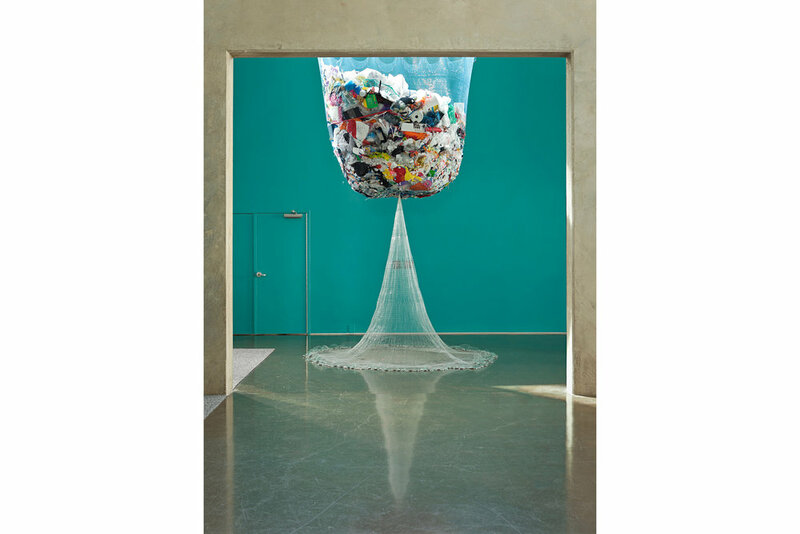 In 2006, after learning about the Garbage Patch, the Wertheims began crocheting plastic as part of their Crochet Coral Reef project, and they aimed to create a Toxic Reef as a post-modern sibling to the classical beauty of their yarn-based reefs. But art cannot be our only response to ecological destruction. "How much plastic do we used?" they wondered. As an experiment, they decided to keep their plastic trash for a week. Then a month. They were appalled by what they found was a far greater intake than they’d imagined. The project eventually went on for 4 years, yielding 440 pounds of trash – a far smaller amount than the average US citizen – as the sisters struggled daily to reduce their ingestion in the face of the escalating pressures of consumption. Keeping one’s plastic inexorably becomes a kind of meditative practice, for evert piece of trash must be washed, washed again, and rewashed, purging it of germs that may multiply in storage. This necessary insistence on hygiene transforms the project from one of mere accumulation into a ritualistic process whose demands are determined by unseeable microbes, The Midden's unwitting overlords. Margaret and Christine encourage others to try this exercise for themselves. Keep your own plastic trash for a month, even a week. You'll be astounded how quickly it compounds.